Wednesday October 30th, 1889 We expected the folks from Wood-lawn over the day but it rained so they could not come. I knit all day. Thursday October 31st 1889 We were busy about the work all the forenoon and in the afternoon. Mother and I went to town. She got us a nice table cloth. We are at Hatties awhile. I knit in the evening. Friday November 1st 1889 The folks were to come over today but it rained again all day. I was busy about the work all forenoon and in the afternoon Will and I sat in our room. I knit. Saturday November 2nd 1889 We were busy all forenoon about the work. Will went to a sale. Soon after dinner Mother and I went to town. she got another table cloth. I got two spreads. I knit in the evening. Sunday November 3rd 1889 I helped with the work in the forenoon and Will and I went to church. I read awhile in the afternoon after doing a little work in my room. The folks from Wood-lawn were over for supper and to spend the evening. I enjoyed it. Monday November 4th 1889 We got up early this morning and Will took Father to the depot to go to Topeka. Will began his husking today in ernest. We washed today. Soon after dinner Mother and I took Winnie over to get her a cloak. I got some groceries and we went down to Hatts awhile. I came on home early to roll up the clothes and get the supper. Tuesday Novmebr 5th 1889 Election day. We ironed part of the things this morning. Fanny & Sister was over for a visit and Ott came for dinner. Hatt was here in the afternoon to go home with the girls. I mended table cloths in the afternoon. 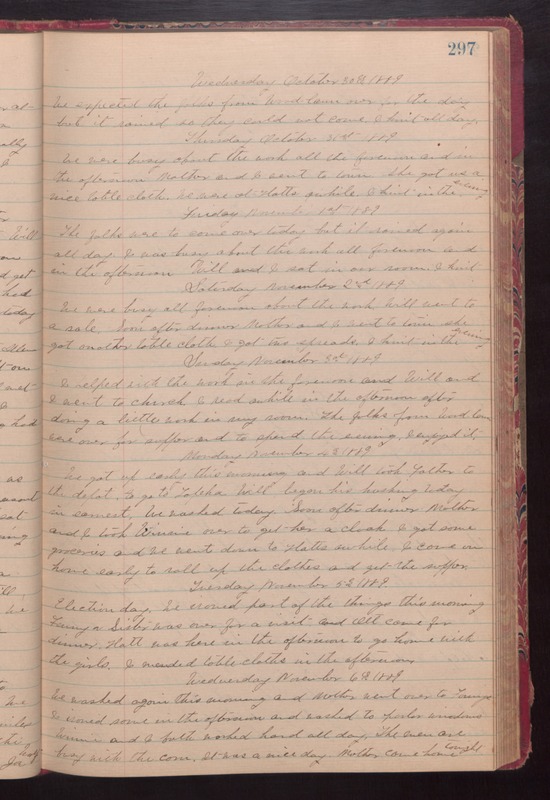 Wednesday November 6th 1889 We washed again this evening and Mother went over to Fannys I ironed some in the afternoon and washed to parlor windows Winnie and I both worked hard all day. The men are busy with the corn. It was a nice day. Mother came home tonight.